Making barriers moving is easy now adays with servo motors. But if we like to have this controlled the way it should, there is more needed than just the servo itself. In the real world, for example, there is a system that senses when the tail of a train just has passed the crossing area, or counting all the wheels/axes before and after the crossing. That can be done in many ways, but it always come to the fact , that it does not matter if a train is 50 waggons long,or just a single locomotive. One way to achieve that on our miniature world, is doing it completely manual. But that is not the way I would prefer, so I started making a solution for a friend in a different way. this system should always work. GCA186 is meant to work totally independant from any other system. All we need is a 9-16V transformer or Adapter. Now the basic is to fix at least two magnets under the train, one in front, and one under the last waggon. More than two is no problem, the limit = 255. NOTE: For a one way traffic, only sensor A and C are needed! Be sure that the train should fit completely between sensor A and sensor C, and/or between point D and B. The first example here is a German type crossing. Many different options will be possible, depending on the software in this unit. That is made easy by using a medium scale micro processor. Assume that a train approaches from the left hand side. The train first activates sensor A.
and shortly after that the barriers descend. 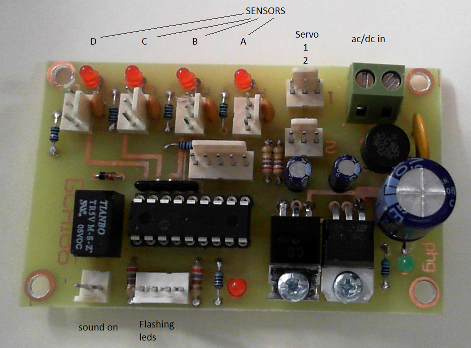 Board contains two outputs for servo's. In the mean time the train continues, and the magnet under the last wagon also passes sensor A. Now, GCA186 has counted two magnets. Passing sensor B has no effect here. But as soon as the train passes point C, the count down starts. the barriers should rise again etc. But that is not the complete end of it. the train also has to count the magnets passing point D in the same amount as sensor A, before the whole system is reset. The flashing lights are only shut off after the barriers are completely up again. If you swap A with D and B with C in this text, you have the explanation for the opposite way. For a one way traffic, different firmware will be available, also for double track. This board cannot service more than doubletrack, nor can it service double track with each two direction driving. That would need many more sensors , which there is no input for. Contact Peter if you need that. It is obvious that sensing the length of a train can only be done if sensors count correctly. Reed switches are not suitable because one action could generate multiple pulses. In fact, current detection (or ground loop detection with Märklin) shows the same problem. IR gates also will not work, unless you will be 200% sure that only one pulse is generated for each loc/waggon/coach. Hall-sensors are ideal for it. The large hysteris guarantees one pulse from each passing magnet. And that is exactly what we need for this unit. Practical users are very enthousistic about this idea.! The usual item, to prove that it works. All firmware is developed with Picsimulator from Oshonsoft.